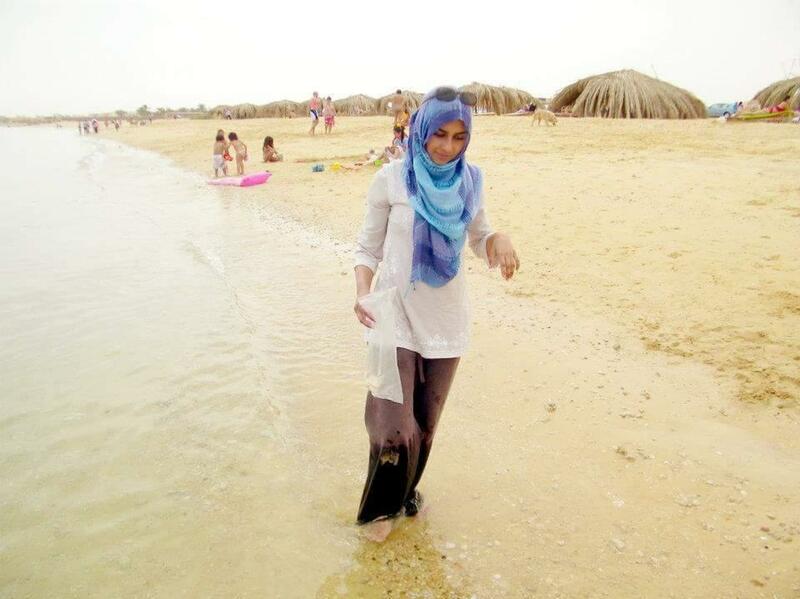 Tania Joya walks on the beach in Egypt in 2012. When her American husband John Georgelas joined the Islamic State in Syria in 2013, she fled with their children and returned to Texas, where she has built a new life. After she returned to the U.S. from Syria, Tania Joya divorced her first husband (not pictured), who is still believed to be in Syria. She went on Match.com, where she met Craig Burma. They married in June and live outside Dallas. "The position I was in was to stay with my son or watch my husband leave with my daughter. I had to make a decision. I thought we could walk back across the border again," she said. There, he declared he was joining the Islamic State. They moved to the city of Raqqa, which served as the Islamic State's de facto capital. She describes a nightmare that unfolded over the next three years, which included her 10-year-old son being forced to appear in an ISIS propaganda video. Cases involving the wives of extremists are complicated, says Christianne Boudreau. She's a Canadian who leads a group, Mothers For Life, that seeks to counter radicalization. She started it after her own son ran off to join ISIS and was killed in Syria. "In some cases, the women made a conscious decision, and it was theirs, and theirs alone," said Boudreau. "In other cases, it's an abusive relationship. It's a very complex situation and it's very difficult to determine which of those two it could be." Strange as it may sound, Samantha Sally's story is not unique. Tania Joya, who lives outside Dallas, immediately recognized the parallels. "I definitely can relate to her, being taken to Syria against my will," Joya said. Joya is a British Muslim who moved to Texas 15 years ago to marry an American man, John Georgelas, who had converted to Islam. Both she and her husband were extremely devout. They strongly supported Islamic movements in general, which led them to move to Egypt. By 2013, they had three young children and a fourth on the way. Her husband insisted they go to Syria, where he wanted to join the Islamic State. Joya resisted, saying she believed the group was too extreme. "I just wasn't prepared to die for Syria. And of course, I didn't want my children to die for Syria either," she said. Her husband persisted. With great reluctance, she says she agreed to go for two weeks. When her husband then decided to stay, she fled with the kids. She called U.S. authorities and asked to be allowed back into the U.S. She was, and still is, a British citizen, but her four children are American. "Finally they said, 'OK. We want you back. You can come back, you know, on the condition that you tell us everything you know.' And I was absolutely happy to help because I wanted to get away from him," Joya said. She moved back with her in-laws in Texas, cooperated with U.S. officials by providing information on the extremists, and was never charged with a crime. Joya divorced her husband, who's still believed to be in Syria, though she's not in touch with him and doesn't know his exact whereabouts. As she began to build a new life, she went on Match.com, with a very candid profile. "I'm looking for a husband. I have four kids. I want someone older than me. My ex-husband's crazy. And I'm here applying for a Green Card," she said of her profile. So how many guys responded to that? About 1,300, she said. Match.com even sent her a note saying she had one of the "top 10 most reviewed profiles of the month." "So I was quite pleased about that," Joya said. Dating for the first time in her life, she learned a lot about male psychology. "A lot of guys on Match.com don't read," she said. "They would be asking me on a date and I said, 'Did you read my profile?' They said, 'No. It's too long.' "
One person who did read her profile was a man named Craig Burma. He and Joya married in June. 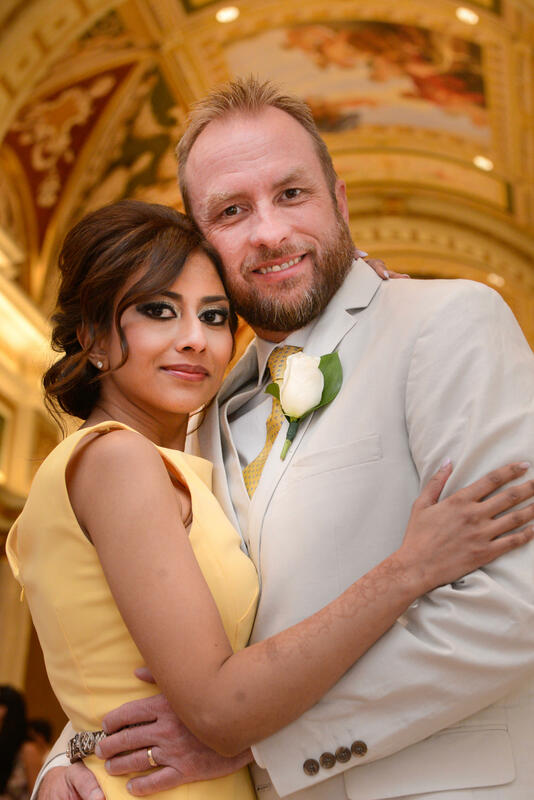 The wedding photos show a stylish bride in a sleeveless lemon dress — a woman transformed from the one who used to wear a traditional Islamic hijab. Happy endings are the exception for the roughly 70 Americans — almost all men — known to have traveled to Syria and Iraq to join up with extremist groups. Some died on the battlefield. Of the 14 returnees to the U.S., 11 have been prosecuted, according to Seamus Hughes of George Washington University's Program on Extremism. "Most come back disillusioned and disenchanted by their experiences in the Islamic State and they're very willing to cooperate with law enforcement," said Hughes. He says this cooperation leads to reduced prison sentences. Those that have been convicted or pleaded guilty are, on average, receiving sentences of around 10 years. Regarding the women who have returned to the U.S. and other Western countries, he said their versions need to be carefully checked. "The argument is, 'I didn't know what I was doing. My husband tricked me. I was just a wife that was living in the Islamic State,' " said Hughes. "If you kind of peel back the onion, you realize that in the most cases there were active participants." Samantha Sally says her husband, Moussa Elhassani, not only fought for ISIS, he bought two teenage girls as slaves and repeatedly raped them in their home. She says her husband also abused her. She gave birth to two more children in Raqqa, and now has four altogether. As the U.S. bombed Raqqa to rubble and the Islamic State crumbled last year, Sally's husband was killed in the fighting. She and her kids were among the civilians allowed to leave the devastated city, and they wound up in northern Syria at a detention camp run by a Kurdish militia allied with the U.S. The family was handed over to the U.S. military and flown to Indiana on July 24. Sally has been jailed on a charge of making false statements to the FBI. But she has not been charged with supporting the Islamic State. The state of Indiana has custody of her kids, at least for now. And there's one more twist in the case. Sally is charged with making the false statements to the FBI in Indiana on March 19, 2015 — which was before she and her family left for the Middle East later that year. Neither the prosecution nor the defense is discussing the details. But the indictment strongly suggests that she and her husband were on the FBI's radar and were questioned before they left on the trip that took them to Syria. "I'm not a psychiatrist, but if she's not suffering from post-traumatic stress disorder, I'll be surprised," said Tom Durkin, the lawyer representing Sally. "We hope to be able to make some progress on getting her out so she can be reunited with her children," he added. Her trial is tentatively set for September. All right. Over the years, hundreds of people left the U.S. to go fight with ISIS in Syria and Iraq. Only 14 of them came back. Two of them are women with extraordinary and similar stories. Both say their husbands forced them to go, along with their young children. One woman has built a new life for herself in Texas. The other is jailed in Indiana. Here's NPR's Greg Myre. GREG MYRE, BYLINE: By her own account, Samantha Sally had a comfortable life in Elkhart, Ind., with her husband and their children. But on a family vacation to Turkey in 2015, she says her husband, Moussa Elhassani, tricked them into crossing the border into Syria. She described that fateful moment and the abuse that followed to CNN last spring in Syria. SAMANTHA SALLY: The position I was in was to stay there with my son or watch my daughter leave with my husband. And I had to make a decision. I thought, like I said, we could just walk across the border, and we could come back again. MYRE: Once in Syria, her husband joined the Islamic State. The nightmare that unfolded included her 10-year-old son being forced to appear in an ISIS propaganda video. UNIDENTIFIED CHILD: This battle is not going to end in Raqqa or Mosul. It's going to end in your lands. MYRE: These examples involving the wives of extremists are complicated, says Christianne Boudreau. CHRISTIANNE BOUDREAU: In some cases, the women made a conscious decision. It was theirs and theirs alone. MYRE: Boudreau is a Canadian who leads a group, Mothers For Life, that seeks to counter radicalization. She started it after her own son ran off to join ISIS and was killed in Syria. BOUDREAU: In other cases, no, it's an abusive relationship. It's a very complex situation. It's very difficult to determine which of those two that it could be. MYRE: Samantha Sally's story resonates with Tania Joya, who lives outside Dallas. TANIA JOYA: I definitely can relate to her. MYRE: Joya, who spoke via Skype, is British and Muslim. She moved to Texas in 2003 to marry an American convert to Islam. By 2013, they were living in Egypt with three children and a fourth on the way. Then her husband insisted they go to Syria. Joya resisted. JOYA: Yeah, I just wasn't prepared to die for Syria. And I didn't - of course, I didn't want my children to die for Syria either. MYRE: Her husband persisted. With great reluctance, she agreed to go for two weeks. When her husband decided to stay longer, she fled with the kids. She called U.S. authorities and asked to be allowed back in the U.S.
JOYA: Finally, they said, OK, we want you back. You can come back, you know, on the condition that you tell us everything you know. MYRE: Joya returned to Texas, cooperated with U.S. officials and was never charged with a crime. She divorced her husband, who's still believed to be in Syria. She dated for the first time, going on match.com with a very candid profile. JOYA: I'm looking for a husband. I have four kids. I want someone older than me. I want (laughter) (unintelligible). And my ex-husband's crazy. And I'm here. And I'm, like, applying for a green card. MYRE: So how many guys responded to that? JOYA: Like, 1,300. And then I got, like, top 10 most-reviewed profile of the month. So I was quite pleased about that. MYRE: One was a man named Craig Burma whom she married in June. Wedding photos show a stylish bride in a sleeveless lemon dress, a woman transformed from the one who used to wear a traditional Islamic hijab. JOYA: I'm just trying to rebuild my life, you know, from scratch. And it helps that I'm married. MYRE: Happy endings are the exception for the roughly 70 Americans, mostly men, known to have traveled to Syria and Iraq. Some died on the battlefield. Of the 14 returnees to the U.S., 11 have been prosecuted, according to George Washington University's program on extremism, which brings us back to Samantha Sally, the woman from Indiana. TOM DURKIN: I'm not a psychiatrist. But if she's not suffering from post-traumatic stress disorder, I'll be surprised. MYRE: Tom Durkin is a lawyer, and he represents Sally. She spent most of the past three years in Raqqa, the Syrian city that served as the ISIS capital. She says her husband not only fought for ISIS, he bought two teenage girls as slaves and raped them in their home. She says she was also abused. She gave birth to two more children in Raqqa and now has four altogether. While largely cut off from the outside world, she had occasional contact with her family. Again, Tom Durkin. DURKIN: She has strong family support. They're behind her all the way. MYRE: Sally's husband was killed last year as the U.S. reduced Raqqa to rubble. The U.S. military picked up Sally and her kids from a detention camp run by a Kurdish militia and flew them to Indiana on July 24. She's now in jail, charged with lying to the FBI but not with supporting ISIS. The state of Indiana currently has custody of her kids. DURKIN: She needs help more than she needs prosecution. MYRE: Samantha Sally's trial is set for September. Greg Myre, NPR News, Washington. (SOUNDBITE OF TOKIMONSTA'S "SMOKE AND MIRRORS") Transcript provided by NPR, Copyright NPR.